On April 1, I met Heather, my next-door neighbor at my apartment. Her husband was in Korea with the Army, her marriage was crumbling (allegedly), and we both needed a friend--but there was an undeniable attraction between us. Her little boy liked me (I couldn't stand him--he was a brat), but he'd invite me to come over and watch TV, play video games or sometimes Heather and I went out to eat--maybe twice in the whole time we knew each other. It was so nice to have a friend just 15 feet away, with an overbite and a lazy eye...nice to get a hug when I left too. Much of my depression stopped. On May 16, I gave Heather a Mother's Day gift basket from Bath&BodyWorks. Her husband paid little attention to her (allegedly) and didn't even visit during his month vacation from Korea, so I thought it might make her day if someone remembered her. She returned the basket, left it hanging on my door knob, and stopped talking to me for six months. After that it was just,"Hi" and "How are you?". I guess we both knew the relationship was too risky. I do remember, about a year later, when she was leaving, we had a long talk about what had happened and parted on good terms. I think perhaps she was right to stop communications, although I wasn't planning on an affair at all--I was very lonely and vulnerable. I struggled at work, doing 12-15 hours a night. Squadron policy didn't allow me to take any leave and wouldn't allow me to be more than a three hours drive outside the local area on my days off so I couldn't do most bicycle races. I'd signed up for the "Assault on Mt. Mitchell", an extremely hard ride of over 100 miles of climbs that ended atop the highest point east of the Rockies, Mt. Mitchell at 6711 feet. It was also extremely difficult to gain entry into. Shortly after I pulled that off, my boss told me I couldn't go, and I lost about $100 from that. I was never able to get into that race again. I kept asking him to see this 'regulation' but he could not produce it, blowing it off as not very important. 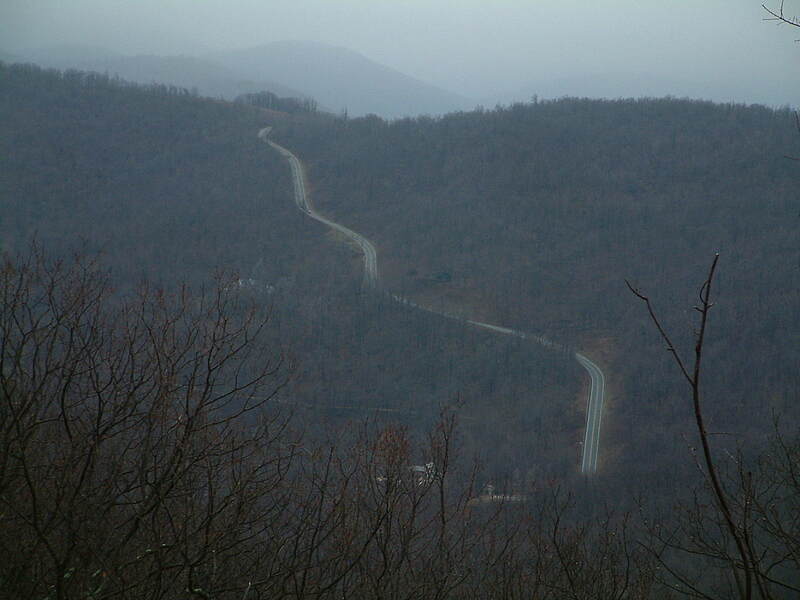 However I could drive to the Blue Ridge Parkway and ride the mountains. My first trip, alone, was on May 22nd. I'd forgotten to bring my contact lenses, so I had my spectacle frames right in my line of sight, bouncing on my face every time I hit a bump. I decided to go out 25 miles, turn around, and come back. Right at 25 miles, I started going down the hill pictured above. I was just about at my limit of comfort when the road angled down even more, causing me to accelerate, and I tensed up so much that I was in an uncontrollable wobble at 50 miles an hour. It was pretty, but deceptive. 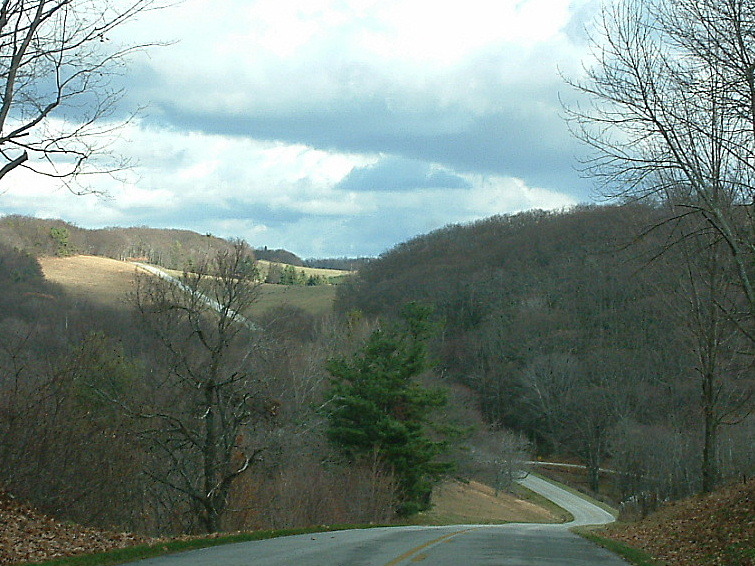 Then, as I recall, on the way back to Afton, on that ride or a succeeding ride (it's been a long time and I'm old now), I took an exit on a side road that said 'Wintergreen'. I took a sharp turn and the sign said 15% grade. 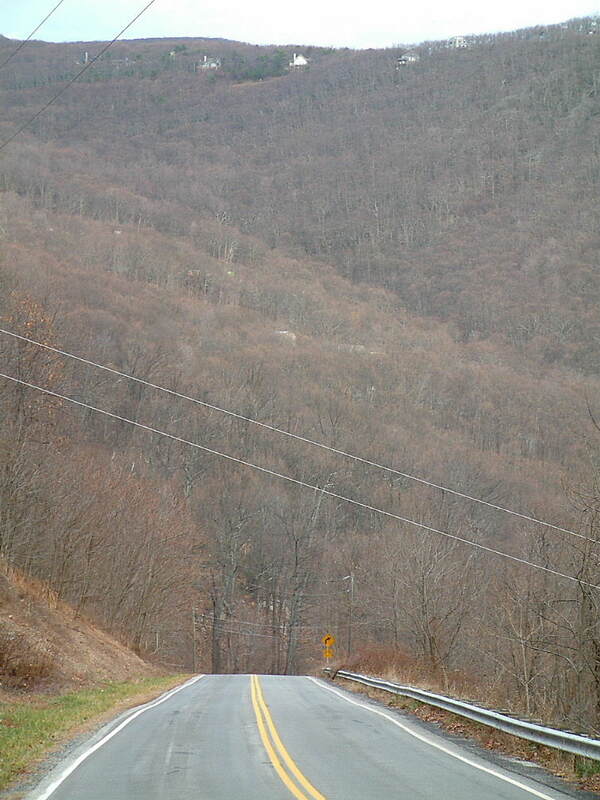 It ran past the Wintergreen Ski Resort entrance and was called Reeds Gap. The first time down, I practically rode my brakes the whole way down--below you see the 15% section that suddenly steepens to 21%. I was getting so nervous that my brakes were heating up and not grabbing, my thumbs and hands were locking up, and then, the road disappeared. My usual manly way of dealing with this was taking a cleat off the pedal and dragging it on the road instead of flying into a patch of trees at 50 miles an hour. However, I doubt I ever got past 30 miles an hour on that decent, so afraid to let loose, and of being unable to rein in the speed. I descended like an old lady. It was 5.7 miles long with the last two miles ridiculously steep--the UCI has it rated as a Category 1 (the hardest measurable climb), and it was featured in the 1991 Tour de Trump/Tour DuPont international race. Below photo shows the top 1/6 of the climb, and the very bottom panoramic photo shows the steepest section by the Wintergreen entrance, which had the added difficulty of being on a turn. It took me six tries to make it up this climb without having to stop and walk my bicycle at least once because of the combination of difficulty and heat of the exposed road. When I stood on the pedals the back wheel would come loose at the slightest bit of gravel, and when I sat on the bike and tried to force my way up the climb I had to be very careful about the front wheel coming off the ground. Walking the bicycle wasn't too easy either. I finally conquered it on my 38th birthday in December, when it was so cold that there was still snow on the ground, and even then, a scary patch of slush and ice just 100 feet from the finish almost ended my ride. I've only ever ridden my bicycle all the way down it twice.